@starkmantony aw you ol’ softie you! thanks for the edible arrangement! @unbeatablesg Don’t mention it. Really. @unbeatablesg What did I just say? The first time Nancy kissed Doreen she tasted like acorn buttercream and New York City grit. Nancy had never thought of that as a winning combination, but somehow Doreen made it work. She also dipped Nancy, because Doreen kissed like she did everything else: with 300% enthusiasm and like she’d learned it off a pack of trading cards written by a maniac in a full-face mask. The Chilling Crimes of Chinchilla Chick may not be an actual canonical Unbeatable Squirrel Girl comic, but it’s pretty much the next best thing. Actually, it’s got femslash, so it’s inherently better. Let’s do this. I’ve been a fan of the Marvel movies for some time now; they’re usually, at worst, a great visual spectacle. But for me, this never really translated into reading the comics. Superhero comics don’t exactly jump out at me visually, and even when socially inclusive, they typically have borderline impenetrable lore. 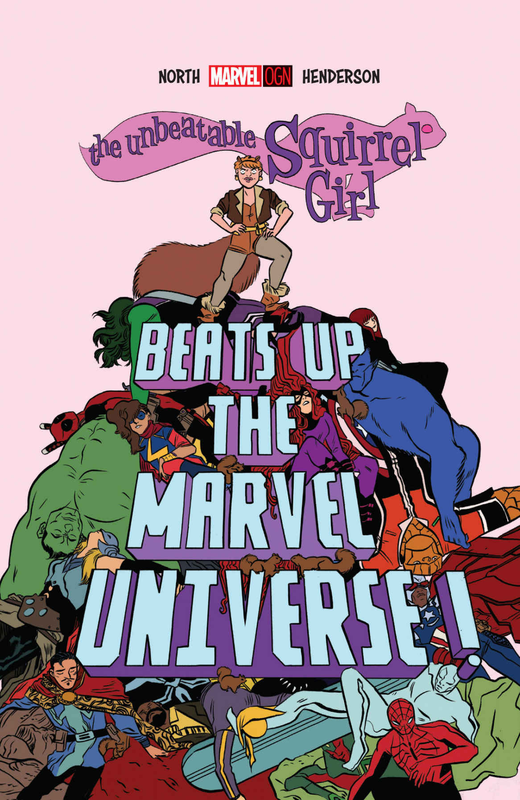 So when I heard there was a standalone graphic novel for Squirrel Girl, I knew I had to pick it up: even though my knowledge of the character is very limited, I did know she is one of the funnier heroes and has a far above average success rate at defeating the universe’s villains. I had been interested in Squirrel Girl for a while, but wasn’t sure where a good jumping on point would be. Additionally, who wouldn’t want to see one character (other than Thanos) beat up the whole Marvel Universe? I was not let down. Minor/early story spoilers for The Unbeatable Squirrel Girl Beats Up the Marvel Universe ahead. Do you like to be happy? To laugh and to read about cute things? To have the Spider-man song stuck in your head for days? 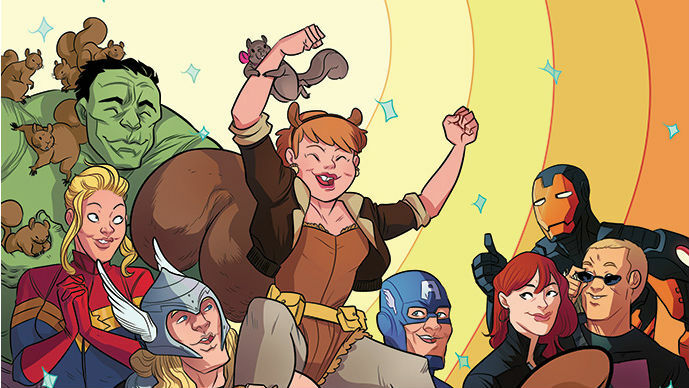 Okay, maybe you don’t like that last one, but if you’re a fan of any of the three former, you need to go buy The Unbeatable Squirrel Girl #1 by Ryan North and Erica Henderson.